Literature Hits the Streets of NoHo at the 3rd Annual Lit Crawl L.A.
L.A.’s biggest literary night out features more than 200 SoCal writers and artists in more than 40 literary performances & readings at restaurants, galleries and more! Thousands of literary arts lovers from throughout Southern California are expected to converge on the NoHo Arts District for one night of “literary mayhem” at Lit Crawl L.A. On Wednesday, October 21, 2015 from 6PM to Midnight, NoHo becomes a choose-your-own literary adventure experience with more than 35 restaurants, bars, theatres, galleries and more hosting 40+ literary happenings, featuring hundreds of SoCal’s best writers and artists! Audiences will enjoy performances and readings and meet well-known L.A. authors and celebrity writers in addition to dozens of members of L.A.’s diverse literary scene. Lit Crawl L.A. is FREE to attend with the exception of the Closing Party and is an entirely walkable experience. * 6:00PM Opening Program at the Laemmle NoHo 7, 5240 Lankershim Blvd. * 10:00PM Closing Party at Studio 77, 5077 Lankershim Blvd. The complete Lit Crawl L.A. in the NoHo Arts District schedule is available at www.LitCrawl.org/LA. A few of the outstanding collection of 200 writers and artists participating in the Crawl include: Johnette Napolitano (Concrete Blonde lead singer), Erin Aubry Kaplan (Journalist and Novelist), Janet Fitch (White Oleander, Paint it Black), Jerry Stahl (Permanent Midnight), Joe Loya (The Man Who Outgrew His Prison Cell), Amanda Gorman (Los Angeles Youth Poet Laureate, 2014-15), Julia Horwitz (Los Angeles Youth Poet Laureate, 2015-16), graphic novelist Derek Kirk Kim (Still Life), Ryan Gattis (All Involved), S. Pearl Sharp (NPR Essayist and Commentator), Los Angeles Times Book Critic David Ulin (Sidewalking: Coming to Terms with Los Angeles – to be released October 6), Samantha Dunn (Not By Accident), Susan Straight (Between Heaven and Here), Tony Valenzuela (Executive Director, Lambda Literary), J. Ryan Stradal (Kitchens of the Great Midwest), Jillian Lauren (Everything You Ever Wanted), Tod Goldberg (Gangsterland), Barbara Keegan (Emmy award-winning actress), Xochitl-Julisa Bermejo (award-winning poet), and more! The 40+ literary performances and readings include programs like: Zombies vs. Vampires from PEN Center USA, All-Female Literary Smackdown from UCLA Extension Writers’ Program, Show & Tell Comics from Los Angeles Cartoonists of Color, Choose Your Own Los Angeles from Heyday, Word Power: The Los Angeles Youth Poet Laureate Showcase from Urban Word Los Angeles, Coming Out, Coming of Age, or Just Plain Coming: Tales of Queerdom from Lambda Literary, Hands Like Eyes / Eyes Like Ears from Invisible Stars and Watts Village Theater Company, Lit-alingus from Cultural Weekly, and more! 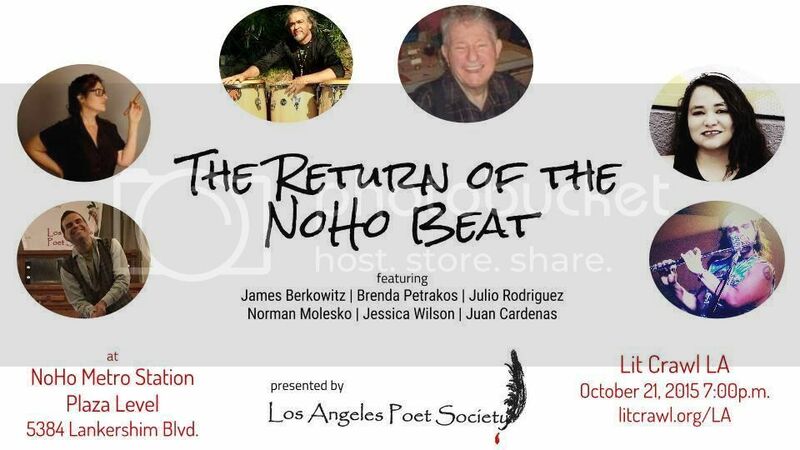 Several presentations will combine music and words with The Return of the NoHo Beat from the Los Angeles Poet Society and “From the Mouths of Musicians” from The Empire of Fun. 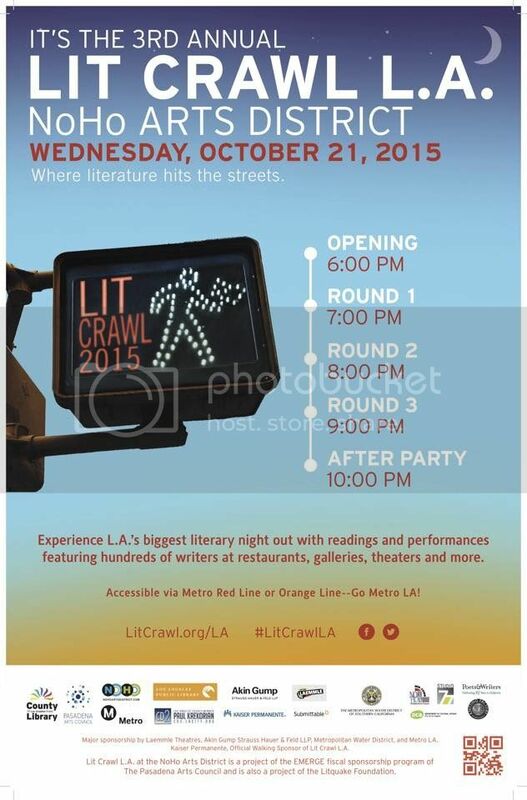 Lit Crawl L.A. was founded in 2013 by leaders in the local L.A. literary community. Conrad Romo, host of the Tongue & Groove reading series, approached the host of The New Short Fiction Series, Sally Shore, and former West Hollywood Book Fair Director, Rosalind Helfand, with the dream of founding a large scale LA crawl that unites literary lovers and creators. The first crawl was a huge success, drawing over 2,000 guests. In 2014, over 3,000 lit crawlers attended the event for an amazing literary smorgasbord. Lit Crawl L.A. The crawl is receiving tremendous support from the local community and the city of Los Angeles. 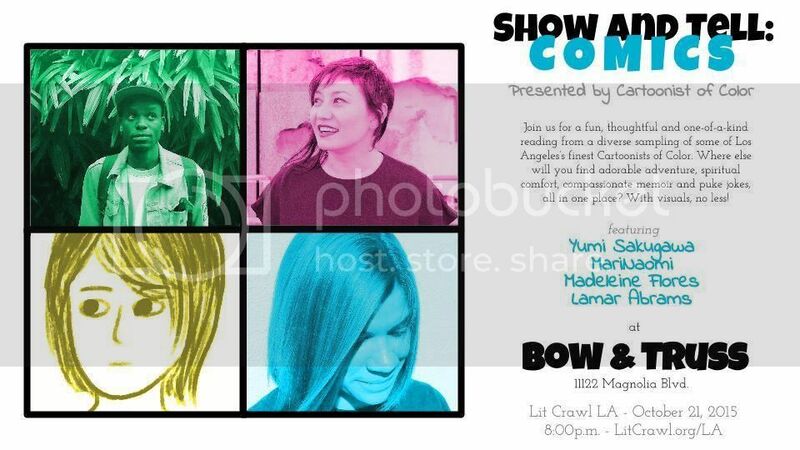 This year, Lit Crawl L.A. is also teaming up with Metropolitan Water District of Southern California to put a spotlight on water with The New Short Fiction Series’ Water, Water Anywhere??? featuring spoken word performances of short stories by L.A. authors, and Weather Report: Stories of Drought and Rain presented by the College of the Desert. The Opening Program is made possible by Laemmle Theaters at the Laemmle NoHo 7 at 5240 Lankershim Blvd. Held from 6pm to 6:45pm, the Opening Program will include an energetic program of poetry readings getting audiences ready to crawl plus special guest speakers. Kaiser Permanente, Lit Crawl L.A.’s Official Walking Sponsor, will participate with goody bags for Lit Crawlers. Lit Crawl L.A.’s annual Speak-Easy Closing Party will be hosted by Studio 77 NoHo at 5077 Lankershim Blvd. from 10pm to Midnight. The party will include food, beverages, music, prizes and more! Guests will soon have the opportunity to purchase tickets for the party at www.LitCrawl.org/LA. Lit Crawl L.A. in the North Hollywood Arts District is a walkable event and all Lit Crawl L.A. presentations take place less than a mile from the North Hollywood Metro Station. Audiences are encouraged to Go Metro to Lit Crawl L.A. by taking the Metro Red or Orange Line to North Hollywood Station in the NoHo Arts District. To determine the best route, guests can use the Metro Trip Planner or call (323) Go Metro (323.466.3876). Lit Crawl L.A.’s major sponsors include Metro LA, Kaiser Permanente, Laemmle Theaters, Akin Gump, Knitting Factory Entertainment, Studio 77, Metropolitan Water District of Southern California, and the Mid-town North Hollywood Neighborhood Council. Presenting partners include the Los Angeles Public Library, County of Los Angeles Libraries, Los Angeles City Council District 2, the NoHo Arts District Business Improvement District, and the Department of Cultural Affairs Los Angeles. Other sponsors include NoHoArtsDistrict.com, Poets & Writers, Submittable, and Mod Pizza. Lit Crawl L.A. is a project of the EMERGE fiscal sponsorship program of The Pasadena Arts Council and the Litquake Foundation. The Lit Crawl originated in 2004 as part of Litquake, San Francisco's Literary Festival. San Francisco’s Litquake Literary Festival runs October 9-17, 2015, with annual Lit Crawls in Los Angeles, NYC, Seattle, Iowa City, Austin, London, Helsinki, and Portland.